Sun rise over the Arc de Triomphe set the scene for the start of the Paris Marathon, a race in its 37th year and known as a ‘runner’s marathon’ for it’s flat course and fast times. Rachael Woolston took in the spectacular sights along the route, from the Eiffel Tower in the west to the Chateau De Vincennes in the east. My third marathon in six months, and my biggest by far, with over 39,687 runners compared to 4000 in my last two races. I’d booked my trip through the tour company Sports Tours International, who organise trips to international sports events around the world. It meant that we had the advantage of being taken to the start via a route that avoided all the big crowds. We arrived right at the baggage drop with plenty of time to walk to the spectacular Arc De Triomphe which was lit up burnt orange in the first sunshine in two weeks. From there, while other runners were hurriedly having to skirt the wire boundary fence to the baggage drop, we were able to calmly head down to the start pens on the Champs Elyssee. Sunny it might have been but it was freezing as I stood shivering in the pen with two other runners, Elly and Sally. They were both first timers who had also booked with SportsTours, and who I had met that morning. It made a big difference being at the start with others bonding over our need to go for a nervous pre-race toilet visit, but giving up at the sight of the long line to the two toilets per pen. There were no fancy dress runners in our pen, only French runners who had cleverly thought of wearing disposable carpenters’ overalls to shield them from the cold. With a traffic light stystem to release the pens, it wasn’t until 15 minutes after the start at 9am that I finally started running. Only to discover my feet – having had no room to warm up, were frozen solid. But my mind was taken off them by the heart-soaring experience of running down over the cobbles towards the golden oblesik at the Place de La Concorde, with the streets lined with spectators. You have to be careful to pace yourself at the beginning as the route heads downhill, and I had to will myself to slow down from a 7 minute mile pace. It then heads past the Louvre, the world’s largest museum, before heading up towards Bastille and out to the city’s biggest park, Bois De Vincennes, carved out of former Royal Hunting ground. One of the beautiful things about this course, is how it takes in familiar sights so evocative of Paris, right to areas you may never have visited before. At the park, I was taken aback by the imposing structure of the Chateau De Vincenne. But that was matched a few minutes later by a runner wearing an 8 ft Eiffel Tour, strapped to him by a backpack which pinned his arms to his side. It was the only fancy dress I saw during the entire race. 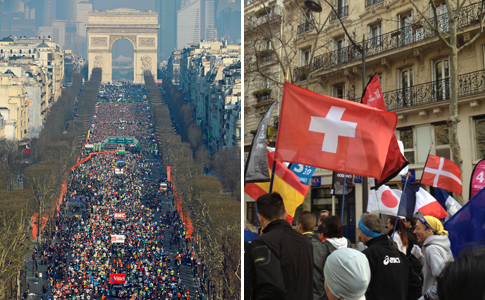 For the first 20kms or so of the marathon, the avenues are wide but on the return back into the city, where the route follows avenues that flank the Seine it narrowed significantly. Getting past runners and trying to avoid tripping others as you moved across their path took concentration. This was not always managed in the latter part of the race by some tired runners and I witnessed several horrible pile ups. Refreshment stalls were another hazardous area. While there was plenty of refreshments from water to sugar cubes, slices of oranges and chunks of bananas, there were often a pile up’s at the tables as runners sped in for hydration. Water and orange skins make for a slippery combination. Despite entering with the intention of trying to get 3hours 45minutes I’d discounted my target months before having been injured after Mumbai. But during the last third of the race, I began running with one of the four pace makers that they provide in each pen (up to 4hours 30). I’ve never run with a pace maker in a race and it makes such a difference. With shouts of allez to his pack, along with several other things in French that I didn’t understand, the pace maker (or rabbit as they’re known) focused my mind. The spectators all cheer more when you’re with a pace maker and mine was ever recognisable in the crowd of runners as he wore a purple Ronald Mcdonald style wig, along with the official pace makers flag strapped to his back. Never would I have believed that an acrylic coloured wig would help carry me through the final third of the race, those last eight miles that are the ‘real’ part of a marathon. Often, it was impossible, or dangerous to run within the pack around the pacemaker. 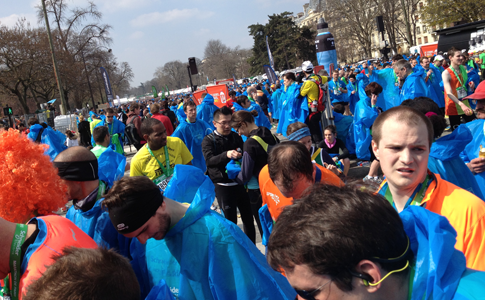 There are so many runners set on a good time in Paris, that you risk being tripped or barged runing in the pack. 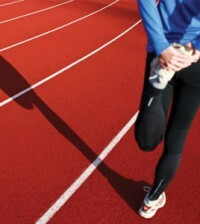 I ran slightly ahead, my ears attuned to the slight clink of his whistle hitting something on his top as he ran closer. It is amazing, despite the noise of the crowds and the pain that does inevitably begin to creep in, how a constant can help clarify and keep the mind focused. It meant that as the sun beat down from an azure blue sky and we passed Notre Dame, Musee D’Orsay and even the Eiffel Tower on the banks of the Seine, I had to ignore my usual desire to stop and photograph the runners streaming down the avenues. If the spectactors were not enough to lift your legs, then there were 90 bands along the route, each reflecting the cultural diversity of the city, from brass bands to Brazilian samba to African drumming. But as all marathon runners know, none of that makes the slightest bit of difference in those final four miles. All that can keep you going then is your mind. Or in my case, the purple wig of the pace maker. 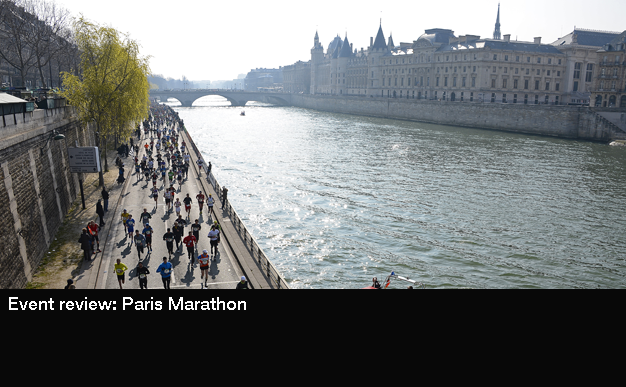 If you are a marathon runner looking to get a personal best, then the Paris marathon pace runners could help. In those final four miles, where a good marathon time can turn into disaster, they really can make all the difference. The final refreshment point at 3 miles to go at the in Bois De Boulogne, was like a rugby scrum, with runners not slowing down as they bumped into you and grabbed for bottles. Note if you run this next year, have a final refreshment on hand so you don’t have to stop. As I fought my way out, I saw the purple wig bobbing up and down way ahead. In that split second when I thought, ‘there’s no way I’ll catch him,’ my legs went from leaden, to leaden in quicksand. But my watch showed I was still on target, and I kept his bobbing wig in sight as I hit the final 2km mark. This is a horrible cobble stone section, which you really don’t appreciate in the final stages, but it also proved to be the the last hurdle as the crowd roared allez, allez and I sprinted over the finish line to finish in 3hours, 44 and 17 seconds. It was a strangely anticlimactic finish, as after the cries of the spectators the finishers area was a sea of blue capes provided to keep you warm. I collected my winner’s medal, finisher’s t-shirt, along with a handful of orange segments and pretzels and shuffled out to find a Parisian pavement cafe to enjoy a few hundred calories and soak up the sun. 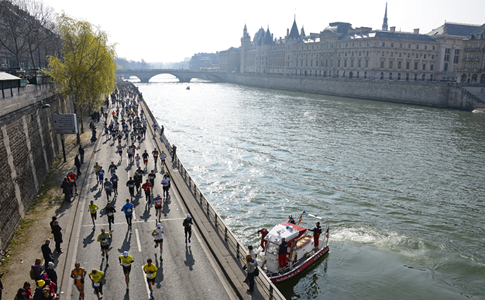 The Paris marathon is known as a ‘runnner’s marathon’ and for good reason. It is a fast course and the runners here are serious. There are none of the extras that you get at other races – the race pack contains your bib,essential information for the race and a packet of pistachios. The finishers haul is your medal, a t-shirt and a plastic cape. The largest represented nation outside the French are American (3%). The Paris marathon is strict about which start pen you enter and will check your number to ensure that you are not trying to jump forward. 39,687 runners. The advantage of having this many runners in a race is that the atmosphere is exciting. The negative? That the queue to get into the correct pen, and the resulting line for the two toilets within the pen was ridiculous. Insider knowledge meant that we avoided the big crowds at the start by not using the main Metro stations and arriving in exactly the right place for the bag drop. From there it was a stroll up to the spectacular Arc De Triomphe before heading down to the Champs Elyssess to the start pens. Joining up with a group definitely takes the stress out of the logistics of running a big city marathon. 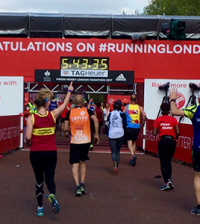 Don’t under-estimate this benefit, tackling a marathon is a big challenge in itself so anything to help you just focus on the running is a good thing. 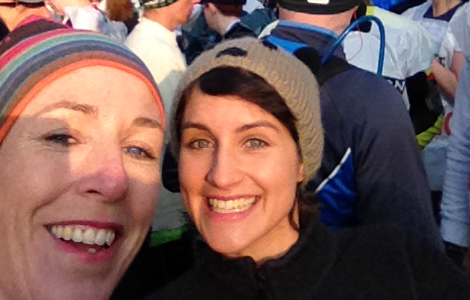 Meeting other runners and having someone on the start-line with you is great, especially if you are on your own. You don’t need to stick together, but it’s nice to see a familiar face at the end.